In 2017, we received a nominal win on appeal, in the sense that the D.C. Circuit Court of Appeals ordered resentencing for Evan Liberty, Dustin Heard, and Paul Slough after ruling that the DOJ's application of the federal weapons law--and its 30-year mandatory minimum sentence--was cruel and unusual punishment in their case. However, because it was case-specific, that ruling is not likely to stop future misapplications of the same law by the DOJ. And we do not want any other service family to experience what the Liberty, Heard, and Slough families have gone through. 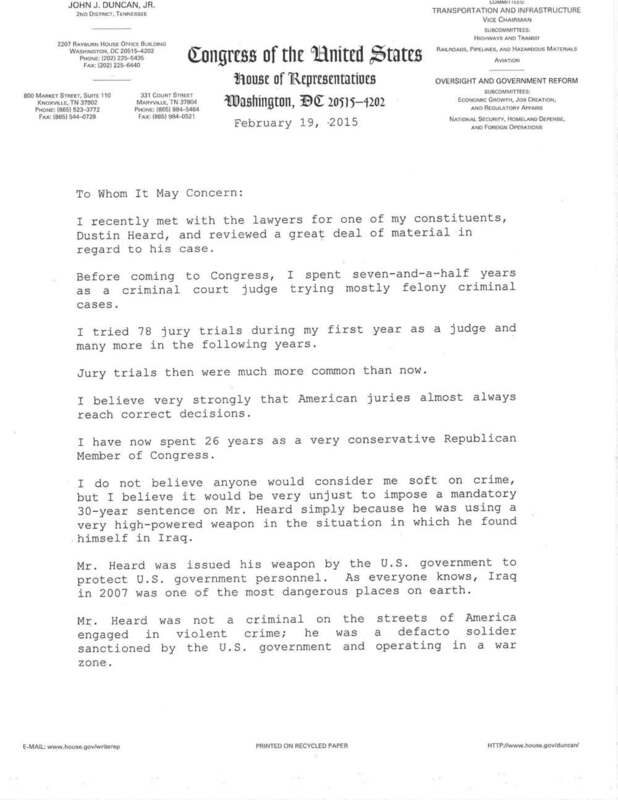 What follows is a "Dear Colleague" letter authored by Dustin Heard's Congressman John J. Duncan, Jr. (TN) that was sent to every member of Congress explaining why the weapons law "was not intended to apply in a prosecution such as this one and why this injustice should be corrected." The need is still there, and Congressman Duncan's letter is applicable to all servicemen and women. Please take a few moments to read Congressman Duncan's letter and its attachment. Then, write your U.S. Representative and Senators and let them know that the DOJ's misuse of the weapons law in the Raven 23 case concerns you and that, although resentencing has been ordered, you expect Congress to take steps to avoid future misapplication of the law by clarifying that it was never intended to apply to individuals, like the men of Raven 23, who use government-issued weapons in the course of their official duties. In addition to his "Dear Colleague" letter, Congressman Duncan has also expressed his belief that the DOJ's application of the weapons law was more than just an abuse of its charging discretion. He has also indicated he believes that the DOJ used the weapons law vindictively, in retaliation because the men of Raven 23 would not accept plea deals. Specifically, Congressman Duncan wrote that, because the weapons charge was added "only following Mr. Heard's rejection of a plea agreement, it would also be reasonable to conclude that [it was] used as a tool of retaliation by the state and not in pursuit of justice." But Congressman Duncan is not the only member of Congress to speak out against the DOJ's use of the weapons law in the Raven 23 case. Evan Liberty’s former U.S. Representative Frank Guinta (NH) has condemned the Raven 23 trial as “steeped in politics” and called for the Attorney General to review the case.